“Be there soon, I’m three stops away!” (even if you are actually five); Tardiness is expected here – t’inquiete pas (don’t worry). In fact, if you are going to someone’s home you better be at least 15 minutes late – it’s common courtesy. This fact was kindly pointed out to my friend and I when we were invited to brunch chez un ami Parisian (at the home of a French friend). He explicitly told us Americans in the invitation that although brunch technically started at 10:30 a.m., this was Sunday morning and he would not be ready for us until at least 10:45 or 11. The French attending this event didn’t need this clarification; they instinctually know these things and probably wouldn’t be ready themselves until 11:15. This is a harder adjustment for some than others. One of my American friends, very low maintenance and always punctual, got so fed up with waiting for everyone everywhere we went that after just a few weeks in Paris she learned to leave her apartment at least a half an hour later than planned. And even then, she was never the last to arrive. “PDA” (pubic displays of affection) is a way of life. A French friend asked me once why people call Paris the “City of Love.” I believe the massive amount of PDA you are bound to walk past in the street (or worse, get caught next to in the metro) is the true reason – not because Paris’s beauty makes it infinitely more romantic as a city. There is no age limit on those partaking in this habit of a passionate embrace in the street. You are just as likely to catch two retirees mid-smooch as you are to bump into a couple of giddy teenagers. Scarves are practically an extension of the human form for both genders – partially, I’ve found, so you can block out the smell of urine in the metro corridors, made all the worse on the many rainy days when the dampness creeps into the tunnels and magnifies the stench. Luckily, Paris is beautiful in the rain. So wrap that scarf a little tighter to block out the cold, grab your umbrella and stroll through the streets, checking out the various colors, patterns, and materials others have chosen for this key piece of their outfits. Pay special attention to the men; les Parisians really know how to embrace their neckwear with style. But remember, scarves for men are only for the colder months. Even in Paris, only us women can get away with scarves after the temperature has risen. Coffee is always espresso – unless it’s “pour over” (a sort of filtered coffee made with an hourglass shaped Chemex contraption) or Aeropress (a very serious process that involves scales and intense concentration to achieve the perfect flavor profile) in a hipster café full of 20- and early 30-somethings in their Stan Smiths. Like the scarf, sneakers are serious business here, worn equally as often with dresses and business attire as they are with jeans and a simple T-shirt. In cafés like these, you come to admire the style of the customers as much as you come to get your caffeine fix. Milk here is never, ever skim. The closest you’re going to get is demi écrémé, which is more akin to 2% and not nearly as delicious as the whole milk that makes up your cappuccino. You eat your salad after your dinner and your water glass doesn’t contain more than three gulps. Parisians are somehow able to make it through their meal without drinking much of anything, unless it’s red wine of course. This is especially difficult to get used to and you will drive your French waiter crazy when he has to switch out your carafe d’eau (the pitcher of water you can ask for, free of charge) multiple times throughout the evening – if he even bothers, that is. Movie theaters here in Paris used to be real theaters, and preserve their plush velvet seats, stages, and mezzanines without a cup holder in sight. Popcorn is offered, but in my experience it is very rarely consumed and doesn’t have that delicious butter flavoring we are accustomed to in the U.S. A night at the cinema is a weekly (or bi-weekly) activity for many. Serious moviegoers get a subscription card that allows them to see as many movies as they like for a set monthly price. Everyone is always ready to share their opinion on the new film and how this director or that screen writer’s film compared to his last. They know the names of the directors and writers because in France, the lights don’t come on until after the credits have rolled and you are expected to stay seated until you have read them. Children age nine read books like “Le journal d’Edward, hamster nihiliste” (Diary of Edward, the nihilistic hamster) because you have to ingrain the cynicism early. Children here just seem so much more mature than their American counterparts. During my stint as a part time nanny, I was repeatedly surprised by the activities of both daughters. The nine-year-old played me songs from the film Pulp Fiction on her guitar and asked for a trip to London for Christmas. The twelve year old memorized and acted out scenes from Moliere and spent many an afternoon experimenting with photography. Every Sunday the whole family went to their favorite sushi place to devour spicy tuna rolls and sashimi. I don’t personally know any American children under the age of 16 who would even touch a piece of raw fish. The contents of flower shops spill onto the sidewalks, a burst of color in the grayscale streets, tempting you to pick up a bouquet of peonies or a little succulent even if you can’t be trusted to keep them alive. With a flower shop on every corner, it’s no wonder Parisians dress up their white walled apartments with colorful bouquets. While these flower shops offer a treat for your eyes, the many boulangeries offer a treat for your nose. That is, until, just for a moment, the smell of freshly baked bread combines with the expired, sour smell of that overflowing trash can and confuses your senses to no end. Thank goodness for those street cleaners who pick up the many beer and wine bottles that didn’t quite make it into their bins over the course of the evening. Once you need a break from walking, find a spot to enjoy the sights from the comfort of an outdoor terrace. It is perfectly natural to spend hours at a café on Sunday, staring at people under the pretense of “people watching” and devouring a massive brunch. After all, there is always something interesting to see, whether it’s little children tearing around on their scooters or a man in a fuzzy pirate hat. You’ll never be disappointed by these little differences. Elyse Rozina is a graduate of the University of Minnesota-Twin Cities, where she received her B.A. in French studies with minors in Italian and Business Management. In 2014 Elyse was an English Language teaching assistant in Paris. She is currently based in Minneapolis, where she enjoys yoga, photography, and seeking out the newest coffee shops in the area. You may also enjoy A Woman’s Paris® post Travel Diaries: Prelude to Lessons in French – Paris (part one) by Susan Henry. 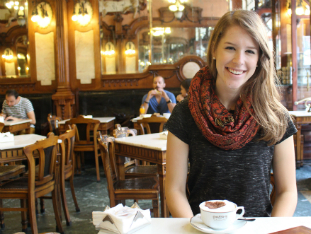 “At the top of my ‘bucket list’ was taking language immersion classes in France to try to improve upon my one year of college French that dated back many years,” writes Susan. “I doubt that I will ever achieve that level of accomplishment demonstrated by my sister – a fluent speaker – who got us around Morocco a few years ago on the basis of her fluency, but if I could travel around Paris and meet my basic needs without speaking a word of English – Mon Dieu !” And so, after finding the perfect program in Sancerre, France, Susan checked off the first item on her bucket list. Travel Diaries: Two for the Road – Paris’s Line 2 (small-scale adventures on the Right Bank), by Rachel Rixen. By following the arc of the métro’s line two that cuts through the heart of the right side from west to east, Rachel sets out to catch a coup d’œil of her northern neighbors in the places that make them feel at home. The sun is hard to come by in Paris’s fall and winter months and any occasion to conveniently forget a beat-up umbrella is reason enough to go on a small-scale adventure. Travel Diaries: On A Moveable Feast (Paris) by Yara Y. Zgheib. Only in Paris can a cold and rainy April day be romantic. Yara takes us cobblestone streets and narrow steps; Acrocc bridges and through gilded archways: Into smelly cheese shops and out of crowded Thursday markets: Past the queue of ignorant tourists outside Ladurée and toward the infinitely better Pierre Hermé. “A weekend in Paris is not enough,” writes Yara. “Nor is a year, or a lifetime. One more café-croissant express, then she heads for the plane. 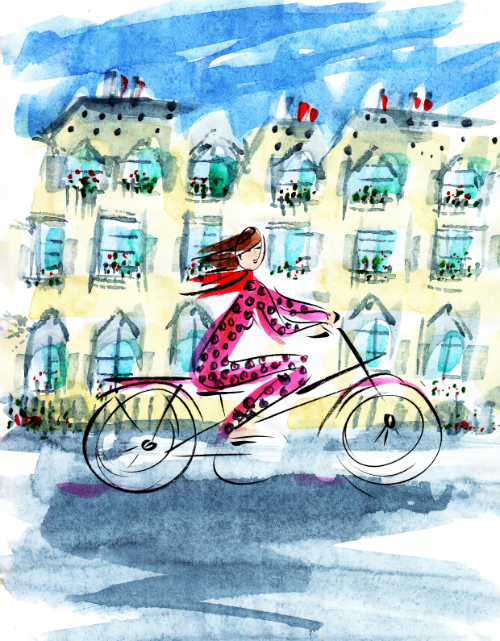 The Art Diaries: From Paris to Bretagne (part one) by Lilianne Milgrom. An artist and writer, Lilianne Milgrom is Paris-born, grew up in Australia, lived for extensive periods in Isreal, and currently resides in Washington D.C. A Winter’s Diary was written during her recent trip to Paris where she curated an exhibition at Saint-Germain des Prés, followed by an extended stay in Dinan as artist-in-residence under the auspices of Yvonne Jean-Haffen Museum. The Art Diaries, first published on AWomansParis.com, are excerpts from her journal A Winter’s Diary. Travel Diaries: Missing your train (in Paris): C’est la vie by Parisienne Bénédicte Mahé who shares stories of missing your train as a result of accidents on the railway due to animals, strikes or the weather––plus other practical ways of getting around France. Including websites to travel by trains in France. Text copyright ©2015 Elyse Rozina. All rights reserved. Great journal. Elyse, I am am a certified ESL teacher with 3 years experience in the conversational method. Would love to work in France, but it seems very difficult to get in without a Euro passport? Any tips? Thank you for your comment. I have forwarded your inquiry to Elyse Rozina who wrote: “Travel Diaries: Paris (Little Differences)” that was published on AWomansParis.com. Hopefully, there will be other readers who respond online with answers to your question. This was such a fun read. I recently returned from a visit to Paris and am reliving everything you described! All so true and fun to read. Another petite difference is the fact that everything is beautifully presented. Those flowers you buy, even on the corner? Wrapped beautifully. Or buy something in a store and the question is always “c’est pour offrir?” And then it’s wrapped. No one eats in a movie because people don’t snack between meals. Opposed to here when I went to the opera in a nearby city and they sold popcorn and candy which people ate while watching the opera! Leave a reply on "Travel Diaries: Paris (Little Differences)"